This week's creative space contains Butterick 5206 sitting about in pieces. Lots of pieces; some might say, more than intended. The pattern I am using is meant to be a mock-wrap frock with a flared skirt and tie. The project was going quite well until The Monumental Mistake. You see, I failed to heed the warning signs. Front and back bodice sides don't quite match? Front longer than the back? Heck, just ignore it. Throw caution to the wind. Sew up the side seam. Without question as the cause of the mismatch. Yes siree, keep sewing that knit fabric. Use lightening stitch; a teeny tiny zig-zaggy stitch. 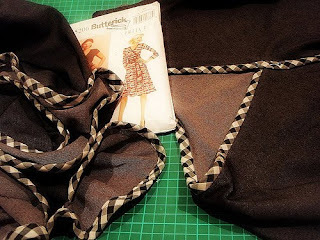 Follow Butterick's instructions to the letter. Sew the seam twice. In black thread, on black fabric. Ahem. Can you see where I am going with this? 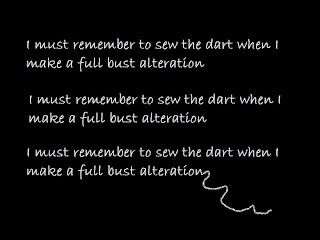 Yes, by the time I realised I had forgotten to sew the bust dart (which incidentally existed only because I added it as part of a pattern alteration) unpicking the side seam was impossible. That baby was stitched tighter than Sandy's bodysuit in Grease. So after a hasty purchase - along with more cutting and sewing - I now have a skirt and two bodices. One of which is a little bit wrong (but sewn very securely). Let's hope I remember to sew the right one to the skirt. Two bodices are better than one? At least one IS sewn securely...? I don't think I am of any help. I would have been on the floor in tears! I feel your pain! I have a perfectly lovely tunic top in the closet - unfinished - cause of an oops too. Good for you for doing something about your boo boo!!!! Aiii! That's about the point I throw it in the corner, take several deep breaths and walk away for a week or so. I have had several stand-offs like that recently with items-of-clothing-to-be. Good luck with it, can't wait to see a photo when it's done! Well the name has a lot going for it- 'Mock Wrap Frock'!!! Why is it that the seam that you need to unpick is always bound together like dried weetbix cement? My sympathies. How bloody annoying. All that work. It's stuff like this that causes good sewers to turn bad. There's only one thing to do.... ditch it all and go the Grease inspired bodysuit. You'd be sure to get Mr HB singing "you're the one that I want, oo oo oo honey...."
so frustrating ... i can't imagine how frustrating it's been.